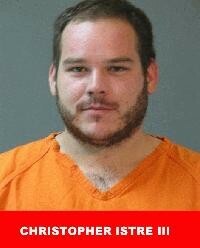 On March 4, Calcasieu Parish Sheriff’s Office deputies were dispatched to a Sulphur home after receiving a report from a woman advising she had received numerous harassing and intimidating text messages and phone calls from Christopher Istre III, 28, 3642 Heurtevant Road, Sulphur. Once deputies arrived on scene the victim advised them that earlier that same day Istre broke into her residence through a window and took pictures inside her residence. The victim also told deputies that for approximately 8 months Istre has been harassing her by calling and texting her phone. On April 14, Judge Sharon Wilson signed a warrant for Istre for $5,000. He was arrested and booked into the Calcasieu Correctional Center and charged with cyber stalking; and unauthorized entry into an inhabited dwelling. CPSO Detective Timothy Scoggin is the lead investigator on this case.